Russia’s development of a nuclear-armed drone submarine capable of inflicting widespread damage on U.S. coasts poses a serious threat, a senior State Department official testified on Tuesday. Rose Gottemoeller, undersecretary of state for arms control and international security, told a House hearing that she has raised the issue with the Russians. "I know we are concerned about it; of course we are concerned about it as threat to the United States," Gottemoeller said under questioning from Rep. Mike Turner. The undersecretary, who is the key policymaker for arms control issues, said the system would be a greater threat if "widely put into operation." The comment prompted Turner to reply: "One would probably be sufficiently troubling." "I think it is a troubling system, sir," Gottemoeller said. The exchange came during a joint hearing of the House Armed Services and House Foreign Affairs Committees on Russian arms cheating that highlighted a developmental weapons system first reported in Sept. 8 by the Washington Free Beacon. The NATO code name for the drone, which intelligence analysts say would be armed with a multi-megaton nuclear warhead for use against U.S. harbors and coastal cities, is "Kanyon." Russian government-controlled NTV television on Nov. 10 broadcast a purported classified document revealing the drone submarine as a nuclear-armed, nuclear powered unmanned underwater vehicle. The document revealed that a large underwater drone called "Status 6" is under development and will be carried underneath one of two types of submarines. The drone can travel thousands of miles at high speeds and could be used for nuclear attacks on U.S. coastal cities. A CIA analysis of the document and television report assessed that the disclosure was intentional and part of Russian nuclear saber-rattling. Turner pressed Gottemoeller during the hearing to explain what the U.S. government has done to respond and communicate U.S. concerns to Russia about the drone submarine. Gottemoeller declined to say what the United States is doing in response to the drone submarine development but said she has discussed the weapon system with Russian officials. The discussions "make it clear to them that it is a concern of the United States of America." She declined to provide details on the exchange in an open session. 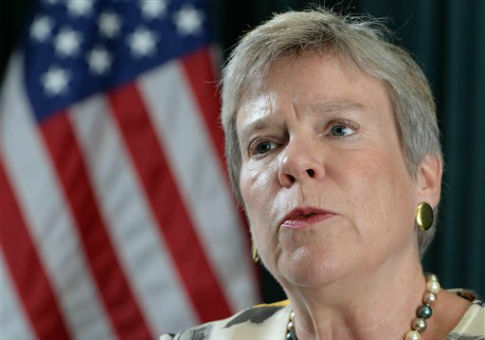 Gottemoeller appeared before the subcommittee on strategic forces to discuss Russia’s violation of the 1987 Intermediate-range Nuclear Forces Treaty. She said Moscow is continuing to deny the development of a new intermediate-range ground launched cruise missile is a treaty violation. Subcommittee Chairman Rep. Mike Rogers (R., Ala.) raised the issue of the nuclear drone submarine during his opening remarks. "According to the Russian translations of what was disclosed, this weapon would provide Russia a new capability to damage ‘the important components of the adversary's economy in a coastal area and inflicting unacceptable damage to a country's territory by creating areas of wide radioactive contamination that would be unsuitable for military, economic, or other activity for long periods of time,’" Rogers said. "What does it say about a country that feels that nuclear weapons are such a significant tool of its military and diplomatic strategy that it discloses systems in this manner?" Rogers added. "And what does this say about a country that would invest resources in such a weapon? This is just nuts." Rogers said the only time President Obama discussed nuclear weapons is "when he wants to propose reducing them." "The world is paying attention. We need our president to change his rhetoric." Rogers said. On the treaty violation, Gottemoeller and Brian McKeon, deputy undersecretary of defense for policy, testified that Russia is continuing to deny its new ground-launched cruise missile constitutes a violation. Both officials also declined to specify what actions are being taken in response to the missile violation, which has been known since 2011 but only publicly acknowledged by the administration in 2014. "We have made very clear this is not a technicality, a one-off event or a case of mistaken identity," Gottemoeller said of the violation. "This is a serious Russian violation of one of the most basic obligations under the [Intermediate-range Nuclear Forces] INF Treaty." Gottemoeller and McKeon also asserted that the administration believes it is in the U.S. national security interest to remain in the treaty but neither official could explain why. Russian has responded to the violation by accusing the United States of violating the treaty by deploying armed drones and anti-missile interceptors in Europe. Drones are not covered under the treaty and the missile interceptors or defensive weapons that do not have offensive strike capabilities. McKeon said the Russians falsely believe a ground-based version of the SM-3 anti-missile interceptor to be deployed in Romania and Poland are ground-based variants of land-attack Tomahawk cruise missiles. Gottemoeller denied that the administration kept secret all details about the treaty violation during 2010 Senate ratification debate on the New START arms treaty with Russia. Critics in Congress have said that if the violation had been known during the debate, Republican senators likely would have voted not to ratify the treaty. Gottemoeller said the cruise missile development was known since 2008 but it was not clear it was an illegal ground-launched system until 2011. NATO commander Gen. Philip Breedlove confirmed last month that Russia has tested the new cruise missile several time, including a recent test on Sept. 2. "So the violation is not new and yes we are concerned," Breedlove told reporters. Defense officials have identified the new cruise missile by the NATO designation SSC-X-8. McKeon said the administration continues to insist that Russia return to compliance with the treaty and eliminate all of the illegal missiles. He testified that the Pentagon’s Joint Staff conducted an assessment of the threat posed by the new missile if it were deployed. "The assessment tells us that the deployment of such a system by the Russian Federation would increase the risk to our allies and an indirect threat to the United States," he said. As a result of the Joint Staff assessment the Pentagon is reviewing "a broad range of military response options," he said. "The reintroduction of such weapons systems is destabilizing and not in the interests of the United States, Europe, Asia, or Russia," McKeon said. "Russia’s violation of the Treaty, and its policies that challenge the European security order, will not go unanswered." He declined to provide specifics on what steps are being taken in response but said new systems are being funded to counter the missile that will be outlined in the 2017 defense budget. McKeon also said the administration is considering its response to Russia’s treaty violation in the overall context of Moscow’s build up of military forces. The Pentagon is "working to improve our defensive measures to deny Russia offensive capabilities by modifying and expanding air defense systems, including addressing the difficult challenge posed by cruise missiles," McKeon said. Gottemoeller said the Russian missile that violates the treaty is a threat to European allies because of its very short flight time and the difficulty of obtaining warning of an attack. The undersecretary said the government is "puzzled" by the Russians’ development of the illegal cruise missile. President Vladimir Putin has mentioned the emerging threat of intermediate-range missiles from states like China, Pakistan, and Iran. Economic sanctions on Russia for the treaty violation also are being considered, she said. This entry was posted in National Security and tagged Missile Defense, Russia. Bookmark the permalink.